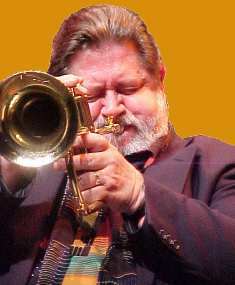 Born in Albuquerque, Bobby Shew started playing guitar at the age of eight but switched to trumpet when he turned ten. At age twelve, he was asked to play in a local “dance band” for weddings and dance gigs. Bobby discovered improvisation at the first rehearsal and the rest is history. Bobby spent summers after high school in New York City listening to the great jazz masters. He attended the first two years of the Stan Kenton Summer Jazz Clinics in Bloomington, Indiana and was able to study under Don Jacoby, Conte Candoli, Johnny Richards, John LaPorta, and Shelly Manne. Bobby attended UNM for two years studying Architecture and Commercial Art. He was drafted into the Army, assigned as jazz soloist to NORAD BAND in Colorado Springs. After service, he moved to NYC and joined Tommy Dorsey Orchestra, rooming and playing with legendary Charlie Shavers. After Dorsey, Bobby went to Woody Herman, Buddy Rich, Maynard Ferguson, Si Zentner, and Benny Goodman. Bobby settled in Las Vegas for 7 years playing top show bands in casinos. In 1972 he moved to Los Angeles and became a first-call studio musician as well as continuing to play on big bands of Bill Holman, Bob Florence, Louie Bellson, Toshiko Akiyoshi, Ed Shaughnessy, Bill Berry, and Nat Pierce-Frank Capp Juggernaut. Bobby is the designer and developer of SHEW model Yamaha 6310Z & 8310Z trumpets and 6310Z & 8310Z flugelhorns. He is the designer of the SOLOIST mute, Yamaha SHEW series trumpet and flugelhorn mouthpieces as well as SHEW series mouthpieces for the Marcinkiewicz Company and for Kelly Mouthpieces ( Lexan mouthpieces ). And, Bobby is the author of “ETUDES AND EXERCISES FOR JAZZ AND CLASSICAL PLAYER” & “BASIC STUDY GUIDE FOR TRUMPET” .